The Government of Argentina has published ENARGAS (National Gas Regulatory Entity) Resolution 42 to enable the importation of vehicles powered by natural gas. According to the official bulletin of the Republic of Argentina, the efficient use of natural gas represents a transition from the secondary energy matrix to cleaner and more efficient fuel use patterns. The approval eliminates a prohibition on the importation of vehicles driven by compressed natural gas (CNG) or liquefied natural gas (LNG) in force since 1980. To date, ENARGAS reports about 1.65 million vehicles have been converted to CNG since the government began promoting development of a CNG industry in 1984. Now the National Government and the Government of the City of Buenos Aires are refocusing development of CNG and liquefied natural gas (LNG) technologies, and addressing the execution of programs for the intensive use of natural gas. As noted in the preamble, the Resolution was stimulated in part by ENARGAS Action No. 7509/18, of May 2, 2018, in which the firm IVECO ARGENTINA SA (hereinafter IVECO) requested the adequacy of the regulations in force, with respect to the authorization of vehicles propelled to CNG, to allow the importation of complete original vehicles, produced and certified in other countries of recognized trajectory in the use of vehicular natural gas, for example, Italy. In particular, IVECO expressed the intention of introducing to the Argentine market units manufactured in Europe and certified under the “UNECE R-110” regulation of the United Nations, which governs the entire European Union. IVECO emphasized that the units to be imported had the backing of the Ministry of Transportation of Italy. Argentina considers approval by this organization as a form of certification endorsement. Two units were subsequently imported, each fitted with an adhesive wafer signaling approval for circulation. Furthermore, through ENARGAS Action No. 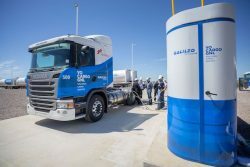 11.366, of June 26, 2018, IVECO informed ENARGAS that it was progressing on a mobility project with vehicles powered by natural gas to be used within the country, and that, as part of this project, was importing to Argentina a CNG-powered IVECO DAILY 35C14N vehicle. The preamble to the regulations also noted that through the Resolution of the Undersecretariat of Transit and Transportation of the Ministry of Urban Development and Transportation, No. RESOL-2018-156-SSTYTRA, the Government of the City of Buenos Aires ordered the creation of the “Pilot Test Program of Buses of Alternative Fuels”, within the framework of the Clean Mobility Plan in the area of ​​the Autonomous City of Buenos Aires, for the period of one (1) year, from the effective putting into service of the buses of these fuels. Through ENARGAS Action No. 10.552 / 18, of June 13, 2018, the firm SCANIA ARGENTINA SA (hereinafter SCANIA) told ENARGAS that it was progressing in a project consisting of the use of six (6) imported trucks, propelled by the use of LNG as a vehicular fuel, with the purpose of operating a Virtual Pipeline between the towns of Malargüe and Anchoris (in the province of Mendoza). It noted such vehicles were fully certified to operate within the EU and therefore qualified for Argentine approval. Click here to download “Resolution 42/2019“, published by Enargas. Click here to download NAG-451, “Procedure for the qualification of imported vehicles, propelled by the use of natural gas”, published by Enargas.